Donald Trump might have been surprised that Nordstrom decided to stop carrying his daughter Ivanka’s product line, but Nordstrom says it shouldn’t have surprised Ivanka. Following President Trump’s tweet on Wednesday that Nordstrom treated Ivanka “so unfairly,” the company clarified that it dropped the line after months of steady sales declines — and that it informed Ivanka about the decision at the beginning of the year. Donald Trump made headlines on Twitter — once again — on Wednesday by pooh-poohing the company for its treatment of his daughter. Nordstrom announced last week that it had decided to stop selling the younger Trump’s clothing and accessory line. Despite Trump’s best efforts, Nordstrom stock rose a strong four percent on Wednesday, closing at $44.53 (see graph below). That means JWN (the company symbol that stands for founder John W. Nordstrom) jumped $1.75 per share. Pretty good when the President of the United States and leader of our economy is betting against you. 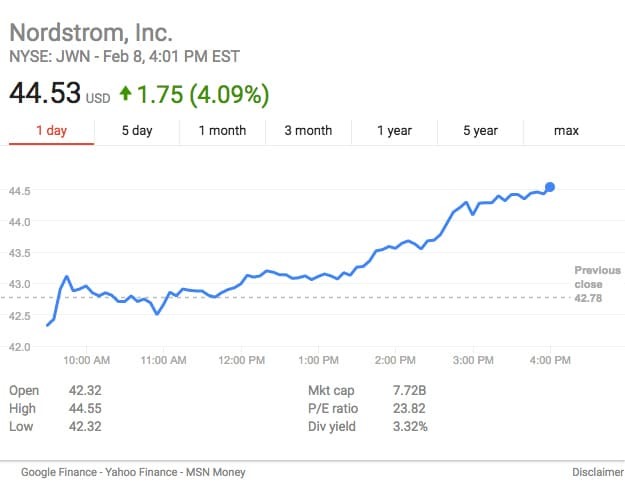 Nordstrom stock actually enjoyed a similar rise on February 3, one day after the store announced that it will no longer carry First Daughter Ivanka Trump’s clothing brand. Donald Trump is entering the Oval Office with the lowest recorded approval rating of any incoming president. Millions are expected to march nationwide against him the day after he was inaugurated. There's a lot of rage going around, and it's being reflected in our music. Here's a playlist of anti-Trump anthems that have been created since Trump began his road to the White House. Green Day turned Trump into a monster in the lyric video for their latest single, "Troubled Times." The last Republican president (George W. Bush) inspired Green Day to make "American Idiot." Who knows what they will make during the Trump era? Anohni collaborated with the experimental sister duo CocoRosie to create "Smoke 'Em Out," a song they hope will serve as a call to the "weary-disappointed hearts of so many crest-fallen citizens." Don't think that Anohni is an Obama fan anymore, though. She also wrote a song about her disillusionment with the President of Hope. In the days leading up to the inauguration, Fiona Apple promoted the National Women's March with "Tiny Hands," a song that features a chant that Apple wants to be yelled out at The March: "We don't want your tiny hands anywhere near our underpants!" Though they never mention Trump, A Tribe Called Quest's latest single "We The People ..." clearly calls out the xenophobic rhetoric that became so prevalent in 2016. Sample lyrics: "Muslims and gays/boy we hate your ways." In a similar vein, English rock band Depeche Mode has released a new single called "Where's The Revolution," which definitely taps into the frustration that has moved millions to protest since Trump took office. Meanwhile, hackers have taken over radio stations in five states that went to Trump in the election and have forced them to play YG and Nipsey Hu$$le's rap song "F*** Donald Trump" on repeat. The day before the inauguration, Moby released a new music video for his song "Erupt and Matter." The video includes Trump among images of riots, terrorism and Bashar al-Assad. OK Go took Morrissey's song "Interesting Drug" and turning it into an anti-Trump song with a video that shows the lowlights of Trump's campaign over the past year. Sample lyric: "There are some bad people on the rise/They're saving their own skins by/Ruining other people's lives"
Trump was such a big deal that Gorillaz ended a six-year hiatus to release a song against him. "Hallelujah Money" features a Trump Tower-like lobby and lyrics that attack greed. Death Cab For Cutie's "Million Dollar Loan" attacks Trump's boasts about his business track record. The title refers to the loan Trump got from his father to help start his business empire. But by far the most rage-filled anti-Trump anthem you'll find is Brujeria's "Vive Presidente Trump!" The Spanish lyrics, told from the perspective of bloodletting Mexican drug bandits, hope for a Trump presidency "because he wants war, just like us. If he starts it, we'll finish it." The track ends with the sounds of the grindcore band hacking Trump to pieces with machetes. Yikes.